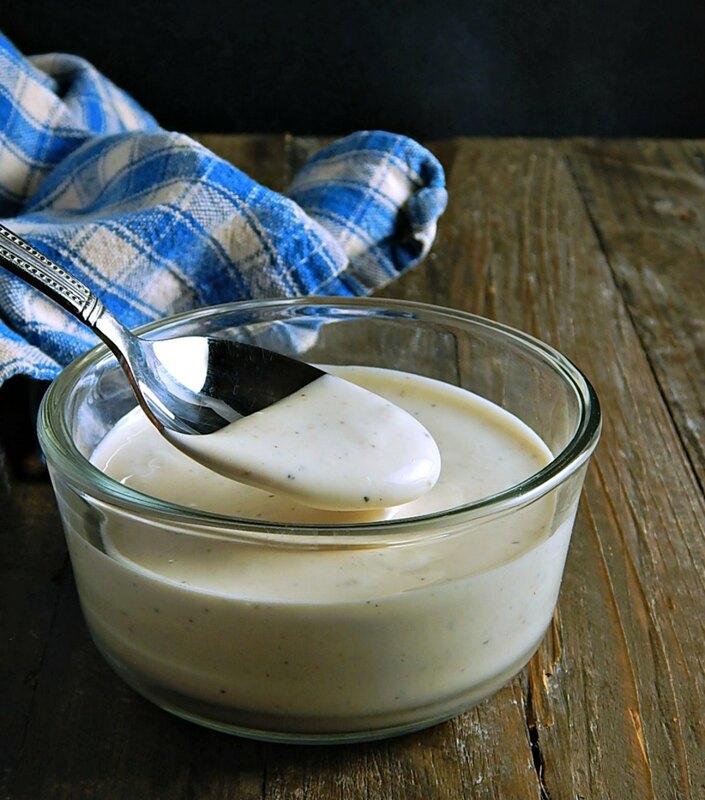 Alabama White BBQ Dipping Sauce has all the flavors of the Alabama White Barbecue sauce, only it’s just a bit richer and thicker and a little more intense. It’s like a wild ride for your tastebuds! If you like Ranch you’re gonna love this. And if you don’t like Ranch you’re still going to love this. It’s that crazy good. About that Ranch thing. I know I’m probably the only person in the world with an aversion to Ranch. And I’m probably even un-American to admit it! #AdmittedRanchSnob. I have found one recipe I do like for Ranch and that’s this Easy Greek Yogurt Ranch. But back to the Alabama White BBQ Dipping Sauce – this is a little thicker than Ranch, creamy and dreamy with a peppy vinegar touch and it’s a little “cleaner” tasting than Ranch, not herby at all. It really is a great dipping sauce for all kinds of things. Just use it wherever you might use Ranch. Sure, it’s creamy and rich but also cuts through the richness of whatever it’s drizzled over. You might want to make this your own, special signature sauce – everyone is sure to comment on it when it’s served, especially if they’ve never been properly introduced to the flavors, before. You might want to use it for wings as I did, pictured here, and that recipe is coming up next. The Alabama White BBQ Dipping Sauce really worked beautifully with those barbecue sauced wings and took them over the top! I think I’d love this drizzled over restaurant style Bacon Brussels Sprouts, too. I see those popping up now as appetizers at all kinds of restaurants these days – they are like a trend that never dies! And that’s a good thing. I haven’t this as a salad dressing, but I’d stick to a good, crisp iceberg or maybe a kale salad; it’s got enough kick to stand up to both but might overpower a more delicate salad blend. You might want to thin it just a bit if you try it as a dressing. There’s nothing to making this quick dipping sauce. Just mix it together and serve as is or refrigerate it for a while to blend the flavors. Once refrigerated, it does thicken up just a little bit. So far, I’ve only used mayonnaise for this dipping sauce, but I think it would work great made with Greek yogurt, too. However you roll – you just can’t go wrong. Make sure to mix up the sauce, taste and adjust any of the ingredients to get your perfect balance. This recipe has no sugar which is a typical ingredient in barbecue sauces. If you lean towards a sweeter taste, feel free to add a teaspoon or so, to taste, of a little white sugar. And if you’d like to use this as a barbecue sauce, maybe basting your chicken or pork with it when you’re making it on the grill, you can’t go wrong with that. That’s what the original White Alabama Barbecue Sauce is for, after all. Just use this recipe and thin this with a touch of water and it will be the right consistency. Not much water; just a tablespoon or two will do it. You can save money on almost any condiments, including the mayo and the Worcestershire sauce by buying them during the summer sales, especially during the Summer Holidays when so many items are discounted. And if you don’t stock up then and run low, you’ll have a second chance. Watch for lesser sales on condiments around the Super Bowl. Vinegar is definitely an item to look for during Lent, right before Easter when you’ll find all kinds of vinegar on sale, even the fancier ones, often unadvertised. You basic whites and apple cider are both usually on sale (for dying eggs) and I stock up, buying several jugs to last through the year. I use vinegar for all kinds of things, not just cooking. Check out my post on Easter & Lent, Leveraging the Sales for other grocery items to look for during this unique sales period. If you use basic spices and herbs a lot, like the onion or garlic powder in this recipe or cumin, cayenne and chili powder (I use them in rubs and spice blends) don’t buy them in the itty bitty jars. Check the buyer’s clubs, Aldi, even the dollar store or discount aisles and pick up the larger jugs of it at a fraction of the cost. These are items that will usually cost less in the larger jugs than in the bulk spice bins or packets in the produce section. Stir together mayonnaise, apple cider vinegar, Worcestershire sauce, salt, freshly ground black pepper, onion powder, garlic powder, and hot sauce in a small bowl. Taste and adjust seasonings, adding more of any ingredients you’d like. Serve immediately or chill to blend flavors. To store, refrigerate for 3 to 4 days, covered. Note: To use as a barbecue sauce for chicken or pork, thin it by adding a tablespoon or two of water to get to the needed consistency. I’ll be sharing Alabama White BBQ Dipping Sauce at Fiesta Friday #267, co-hosted this week by Antonia @ Zoale.com and Abbey @ Three Cats and a Girl. Be sure to stop by and visit! This entry was posted in Click here for Fabulous Food Posts and tagged Barbecue Sauce, Condiments, Mayonnaise. Bookmark the permalink. Interesting! And there’s no cooking involved? lol. nope, none at all! It’s a quickie!! I’m sure I would like this, since I love ranch. I better pin this before I forget. Yes, please! Pin away Angie! Thanks! I like ranch sometimes, but love to find other dipping sauces. This looks really tasty! Thank you for bringing your yummy sauce to the party! Happy Fiesta Friday, Mollie! I live in Alabama and grew up with this stuff. This is not how we make it, but fairly close. I never use it as a dipping sauce though. It is our standard fare anytime we grill chicken. About 10 minutes before the chicken is done we start brushing it on, turning the chicken and brushing more. The chicken is usually basted about 4 times before it is finished and it is unbelievably good. Hi Anne, I took a few liberties since it’s a dipping sauce and I wanted it zippy and thick. But oh gosh yes, your Alabama Sauce on Chicken – it you didn’t grow up with it, it can sound a little bizarre but it’s a life changer!!! Thanks for stopping by and adding the grilling info! Sounds like I better get busy… it sounds delicious! Gail, you’re gonna love this! Why have I never heard of this until now??? I can tell by looking at it it will be LIFE. CHANGING. Thankyouthankyouthankyou. Never heard about this before so I’ll have to give it a try. It reminds me a bit of a Black Peppercorn dressing. It’s just so simple; nothing to lose, Sheree!